O loyal and suffering supplicants! Those who have been following this eternal pilgimage may or may not be pleased to learn that Asperitus, the Oracle of Bitter Truth has once again returned to the land of the living in order to inflict his paltry prognostications thereupon. The Master Asperitus, Primeval Denizen of the Dusty Shelf, has for some months been under heavy sedation (his preferred modus vivendi), so that his dreams are particularly vivid, especially those featuring the disused lavatory in Nhill, the place where the Four Ignoble Truths were revealed unto him. Now the year 2010 is approaching, so select your Sign for the latest transmission from Asperitus, Master of the Petty Prognostory and Oracle of Bitter Truth. Note: For the curious, who may wish to check the previous months of their continuing stories (dating back to April 1, 2001), click the little blue back-arrow near the top of each sign's report. Don't know your sign? Click here! If you know your rising sign, check our forecast for that sign too. To estimate your rising sign, click here. Many people are called on the path of enlightenment. Not all of those called can find their way. Of those who do begin the journey of awakened consciousness, many fall by the wayside. Thus, few ever enter the realm of the golden beings wherein resides the company of the chosen. Of this select few, only one has entered the gates of Heaven by means of insult, corruption and threats of physical violence. This one is Asperitus, runemaster, astrologer, enlightened being and misanthropic recluse. His earliest years were spent in poverty and disillusion, yet his extraordinary spirit thrived as a precocious master of complaint. Then came his meteoric rise to stardom as a tyro of the tendentious tirade, commenting caustically on the lives of rich and poor, famous and nondescript alike. Here he became known as the "hammer of mediocrity" and gained a fearsome reputation for his exorbitant charges. This early pinnacle of success was followed (predictably for he knew it was coming) by a bitter pratfall from grace amid accusations of bribery and sexual misconduct (none of which were ever proven in court). 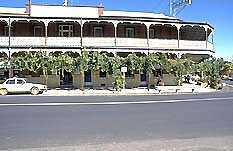 It may have been near this very pub, in Nhill, that Asperitus received his enlightenment! One must acknowledge the irritation. Having acknowledged the irritation, one must criticize it correctly. One must acknowledge that all irritations are equal and therefore everything is equally irritating. Having left the lavatory in Nhill with his newfound wisdom, the master now set out to teach the way of the four ignoble truths. It was on his journey as a teacher of the way that he came to the doors of perception wherein he found the path of Vitriolic nastiness. This is a "nine day" meditation where the first three days are given to constant abuse and insult, the second three are then devoted to incessant complaint and the final three see the seeker retire into a resentful silence that will open the doors of Heaven. At least, they will for Asperitus, given what he charges for this fiasco. Throughout his career as a seer, Asperitus has always turned his evil eye upon the very soul of humanity and seen nothing worth mentioning, even in passing. Tragically, because of a compulsive need to comment upon everything and an obsessive love of the sound of his own voice, he has never been able to keep quiet about anything whatsoever that irritates him. As everything that lives and breathes irritates his esteemed personage, the stream of venom that flows from his gaping maw seems endless. You may bathe in it at this address as often as you wish. You may email the master if you're seeking rude and insulting guidance, though the cost will be high in both dollars and self-worth.